But let’s be clear here; no one wants the party to end. So, despite a struggling stock market over the last year, slowing economic growth, and a collapsing yield curve, there are still plenty of articles suggesting you should just ignore it all and remain invested. Uhm….okay…maybe Ryan just doesn’t get out of the house much but saying there isn’t a bubble in the stock market is like saying Mount Everest is just a mountain. Also, with respect to his point that the Fed isn’t going to kill this expansion, well that too may also be a bit myopic. As shown, the Fed has been hiking rates to offset the specter of inflation which doesn’t exist to any great degree and have likely gone too far. We suspect this, because the recent reversal in policy is akin to what we have see repeatedly in the past. The Fed tends to stop hiking interest rates when they realize they have caused problems within the economy, like a sudden downward shift in housing, autos, and asset prices. The problem with all of the mainstream claims that there is “no recession in sight” is those claims are based on analysis of unrevised and lagging economic data. In hindsight, the NBER, eleven months later, announced that the official recession began in December of 2007. Each of the dates above shows the growth rate of the economy immediately prior to the onset of a recession (this is historically revised data). If Ryan had been making his comments about the economy in 1957, it would have sounded much the same way. This is also likely a mistaken assumption. In reality, it may just be the unwillingness of “eternally optimistic”individuals to pay attention. Take a look at the chart below. The green dots mark the peak of the market PRIOR to the onset of a recession. In 8 of 9 instances the S&P 500 peaked and turned lower prior to the recognition of a recession. So, if you really can’t count on economic data to “alert” you to the onset of a recession, what can you use. 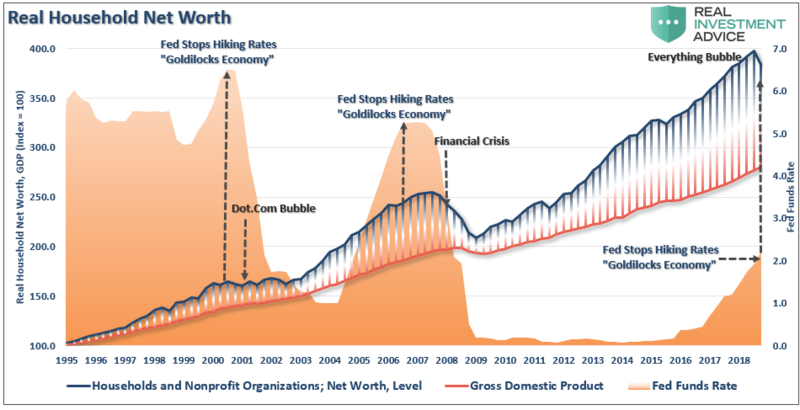 Well, by looking at the chart above, it is clear the stock market leads economic downturns. Also, as we have written about previously, so do yield curve inversions. The chart below combines both which shows this is indeed the case. In every prior instance going back to 1980, the stock market began to peak as the yield curve began to invert. 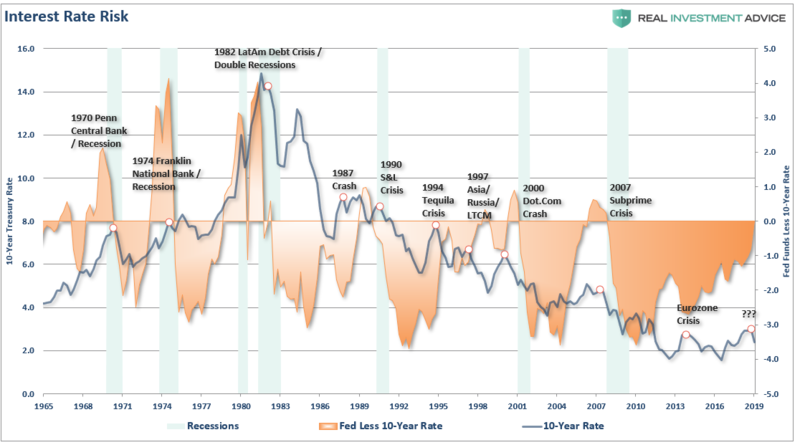 Also, when the Fed Funds rate exceeds the 10-year Treasury, that too has been a pretty strong indication of both market problems and the onset of a recession. Currently, the spread between those two particular rates (at the time of this writing) is +0.0%. The problem for the Fed is in the waiting. 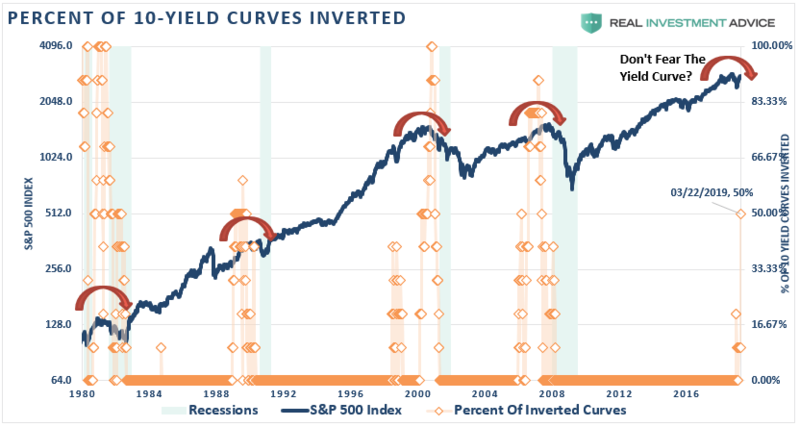 A look back at the charts above show there are only two occasions going back to the 1970’s where the yield curve inverted and it didn’t lead to a recession. The problem with “patience” is that by the time the Fed does act, it will likely be too late which has historically always been the Fed’s problem. Furthermore, the “yield curve inversion” is NOT the illness of the market, rather it is the symptom of virus infecting the economic environment. David Rosenberg just recently penned a rather exhaustive list. The Fed turned TOO dovish, taking out not one, but both pledged rate hikes for this year and trimming its GDP forecasts. The stock market didn’t mind the futures market pricing out future tightening, but discounting rate cuts means the Fed DOES see something nefarious around the corner. Market-based odds of the next move being a policy easing have jumped to 58% from 30% a week ago and 5% a month ago! Remember, the best time to “buy” the market is on the last rate cut, not the first one. The 10-year/3-month yield curve finally inverted, albeit fractionally, for the first time since August 2007. This is not an infallible indicator, but predicts recessions with 85% accuracy. In addition to the uncertainty now at the Fed – Neel Kashkari is not being shy that a policy misstep has been made as he second-guesses even his 2.5% estimate of the “neutral” funds rate. We have a fiscal situation in the USA that also is destabilizing and clearly crowding out private investment. In Feburary, the budget deficit hit a record $234 billion, which is pure insanity (up 9% from a year ago). In all of 2006, the gap was $248 billion. In 2007, the peak of growth in the last cycle, the annual deficit was $161 billion – lower than the past month. When I started in the business in 1987, the annual deficit that year was $150 billion. Now, we do more than that in just one month. And, this level of debt-laden government intervention in the economy is really worth of a forward P/E mulitple that up until recently was pressing against 16x? The flat-to-inverted yield curve is killing the banks. The S&P 500 Financials were crushed 5% last week; the regional banks were down 9.4%. The KBW Nasdaq Bank Index suffered its biggest one-week loss since 2016. The Atlanta Fed is down close to zero percent on Q1 growth and the NY Fed sees the first half of the year at 1.4%, or half of the 2018 pace. He had multiple more points in his “must read” daily missive, but you get the idea. Of course, given the track record of the Fed, maybe you should think differently. He is right. 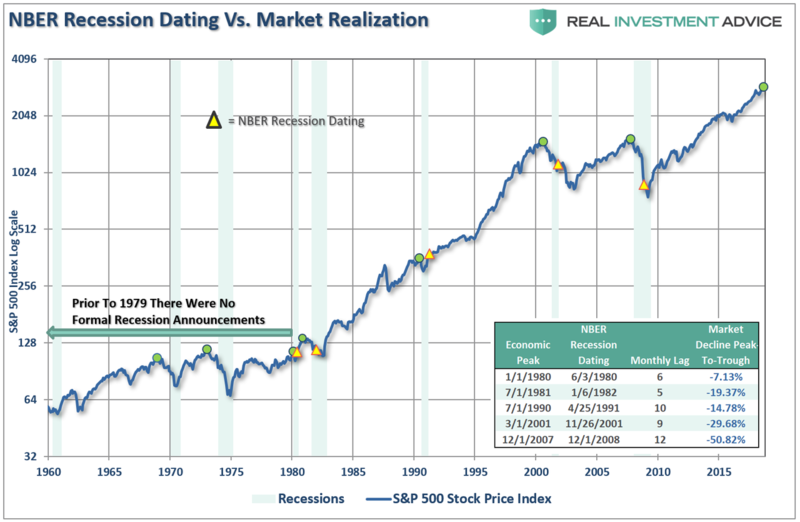 During “average” recessions stocks reprice forward expectations by 30% on average. However, given the massive extensions in markets over the last decade, Larry’s targets above suggest a 50% decline is possible. During the entirety of 2007, the trend of the data was deteriorating and the market had begun to struggle to advance. The signs were all there that “something had broken” but the “always bullish” mainstream media encouraged investors to simply ignore it as it “was different this time.” Unfortunately, by the time the annual data revisions had been released by the Bureau of Economic Analysis (BEA), it was far too late to matter. Today, we are once again seeing many of the same early warnings. If you have been paying attention to the trend of the economic data, the stock market, and the yield curve, the warnings are becoming more pronounced. In 2007, the market warned of a recession 14-months in advance of the recognition. Today, you may not have as long as the economy is running at one-half the rate of growth. We do know, with absolute certainty, this cycle will end. The market, and the yield curve, are trying to tell you something very important.